You remember the Moose in the City, don’t you? 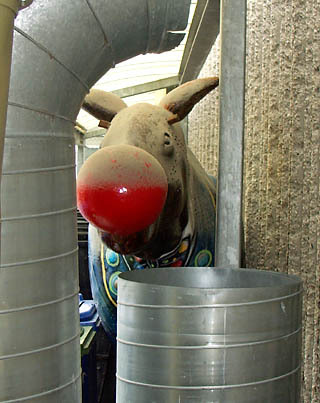 For six glorious months in 2000, more than three hundred fibreglass moose stood watch over Toronto, succesfully saving us from the shame of having hundreds of flying pigs instead. We greatly preferred the moose to any of the subsequent visitors to our fair city including aphids, SARS, and Chilean soccer players. Most of the moose had disappeared by the end of 2000, but a few can still be found on display around the city. 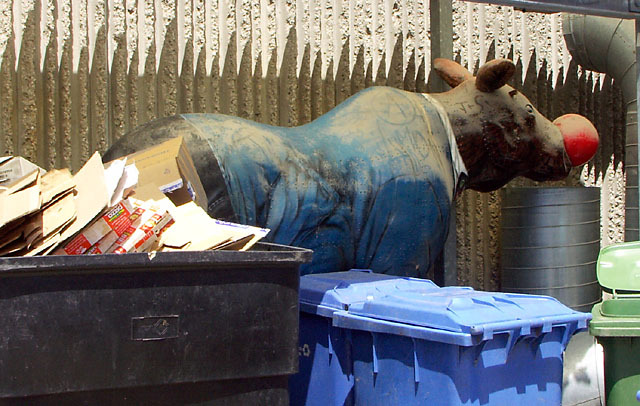 We recently stumbled upon this poor fellow behind the Ontario Science Centre, covered in dust and jammed up against a wall behind piles of discarded shipping pallets and recycling bins, begging for some dignity in retirement. Time Moose Scape began life sponsored by none other than the very organization that callously threw him outside like so much trash. Oh, he tried to stay on their good side by getting a new paint job, donning a new suit and bow tie, trimming off his antlers, and even going so far as to have a giant red clown nose surgically attached to his snout. It was all for naught. More enamoured by the latest plastination and big boat toys, Time’s masters cruelly cast the gritty seven-year-old out into the world to fend for himself. Like any abandoned child, Time has remained close to the only home he’s ever known, scrounging for food and affection in the nearby recycling bins, eventually settling among the empty water bottles and flattened cardboard boxes. But despite the hard turns his life has taken, he keeps a smile on his face. That big red nose could have become a mark of his failure, but Time has chosen to wear it as a badge of courage. It proudly proclaims that one day he will be back among the adoring children inside. Filed under Ontario Science Centre, Science Centre, discovery, hmmm..., kids, Science, soccer, the city, Toronto, Vandals!